Five of the Thirteen prisoners escapees at Koton Karfe prison in Kogi in the early hours of Saturday have now been caught, Kogi Police PRO stated today. This has corroborated by the Ministry of Interior. The jailbreak incident at the prison happened at about 7a.m. when the inmates forcefully brought down the wall of the prison, before extra security measures could be deployed. The all male prison facility which was inaugurated in 2014 has the capacity to accommodate 180 inmates. However, it is currently accommodating 263 inmates as at the time of the jailbreak, Saturday. One of the escaped inmates was re-arrested almost immediately by security agents, NAN reports. This was the third jailbreak recorded in Koton Karfe as the old prison facility witnessed similar jailbreaks in 2010 and 2013. In previous jailbreaks, 132 inmates escaped from the prison and majority were awaiting trials. 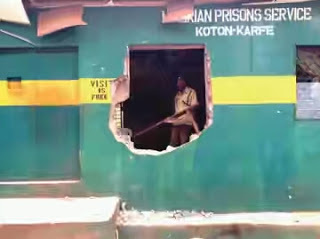 It was gathered that Comptroller–General of the Nigeria Prison Service immediately sent a representative to Koton Karfe to assess the situation.